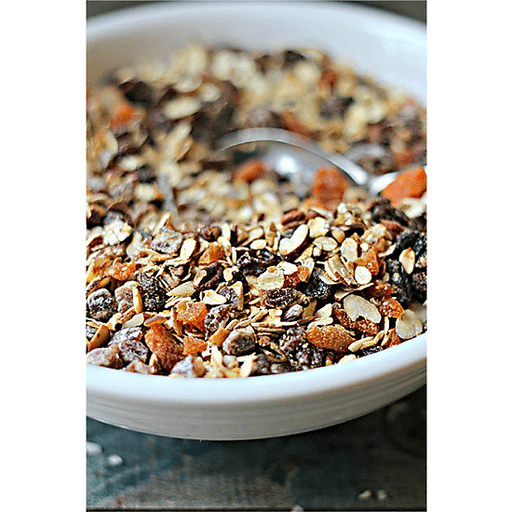 Muesli is similar to granola and made with good-for-you ingredients like whole grain rolled oats, nuts and dried fruit. 1. Preheat oven to 375°F. 1. Mix oats with cinnamon and honey and spread on a baking sheet. Toast for 7-8 minutes. Allow to cool. Add almonds and pecans and toast for an additional 3-4 minutes. 1. Place oat and nut mixture in a large bowl or large Ziploc bag and mix in the chopped dried fruit. 1. Store in an air-tight container or bag for up to 7 days. Enjoy muesli on its own or with milk. Or heat it up with milk to make it into an oatmeal. Calories 220, Total Fat 7g (Saturated 1g, Trans 0g), Cholesterol 0mg, Sodium 0mg, Total Carbohydrate 36g (Dietary Fiber 5g, Sugars 13g), Protein 6g, Vitamin A 4%, Vitamin C 0%, Calcium 2%, Iron 10% *Nutritional values are an approximation. Actual nutritional values may vary due to preparation techniques, variations related to suppliers, regional and seasonal differences, or rounding.